Here is an article by South African Matt Newnham that I found very interesting. I hope you all enjoy it also. I have to admit, as a film lover, and even a lover of good quality TV shows that the sizzle of a blockbuster seems to have stopped sizzling in the last few years. Originality seems to have been lost, with producers and directors finding a recipe and sticking with it, and this is starting to hit the box office takings and cinema viewer opinions. Don’t get me wrong, there is nothing wrong with finding a recipe and making it work; Lord of the Rings, Harry Potter, Indiana Jones and Back to the Future got things right but they also knew when enough was enough, and the horse was still able to frolic and gallop freely without coming anywhere near being a dead one to flog. In the past, directors and producers always gave just enough to ensure optimal revenues, they knew how to find the perfect time gap between next chapters and knew when to stop completely. X-men has seen sequels, prequels, origins and a host of variations and it seems to have worked but is has become a little bit “yawn, not more x-men” and “I know how this will end” and it seems originality has fallen away or is at least starting to. Batman, Superman and any other superhero have all been milked in the last two or three years. The Big budget productions, with same old, same old, have become “normal” and the only creativity seems to be which superhero can be pitched against which. Suicide Squad, that recently hit the circuit, had massive hype leading up to it and didn’t do too badly in the box office with $267million in takings in its first weekend but it wasn’t liked by audiences as the Rotten Tomato scale showed. Movies, and even TV shows for that matter seem to have lost their creativit genius. It can’t be a lack of ideas out there, but something needs to be done to give audiences the blockbuster they need without having to rely on remakes or sequels. Some sequels of many movies simply highlight that Hollywood is not what it was, Independence Day 2 was weak compared to the original that became a classic not just for the movie but also the soundtrack, people went and watched the sequel and left somewhat disappointed. Sometimes a remake or another “adventure in the life of…”, such as the recent Tarzan movies, are filled with hope for audiences. Yes the audience knows what to expect and have a sort of understanding as to who the characters are but it is actually not, especially in the case of Tarzan that in a funny way was little different to the old Johnny Weissmuller movies, what could be called original other than the CGI. Do you remember the first time Star Wars hit the screen, or the first Indiana Jones, the first Rocky movie, back to the future, the deer hunter or Kramer vs Kramer? They were fresh, unique and audiences loved them. Star Wars was even parodied by Mel Brooks in Spaceballs, that doesn’t happen today perhaps because the movies are joke in themselves. That spark of creativity needs to be found to get box offices moving, leaving audiences excited. This summer if you have found yourself watching movies that didn’t quite find that x-spot, you were not the only one. Box offices figures show so and sadly the lack of originality is partly to blame along with directors sticking to an easy recipe that soon makes homemade cakes taste like a muffin bought in a convenience store. Phase 1: Sea Hunter gets its sea trial. 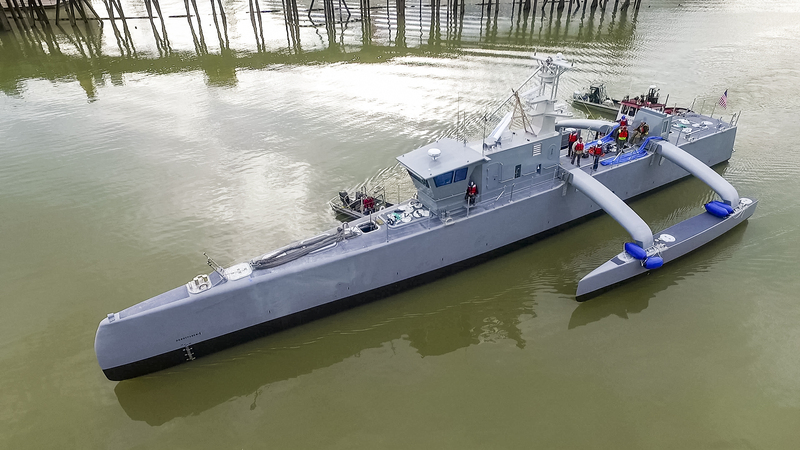 Sea Hunters will be a class of unmanned Navy vessels designed to hunt for and track enemy submarines. DARPA (Defense Advanced Research Projects Agency) is helping develop the ships, and DARPA does some very cool stuff. They gave us the Internet (first called ARPANET), GPS positioning, stealth technology – and I’m sure created the need for mega-caffeinated drinks like Jolt Cola. It is a hunter only, unarmed, not like the Hunter-Killer satellites that don’t exist in orbit right now. The First Weekend for TWEET, up to #14 on Kindle Best Seller List. Last Friday (Nov. 21) my new novel TWEET REVENGE was released in Kindle and Paperback. I had done some pre-release publicity, and TWEET appeared on 2 Amazon Best Seller lists. Within a day of it’s release, TWEET had moved rapidly up the lists until it reached #14 on the Kindle Crime Story sub-genre dealing with Vigilante Justice. 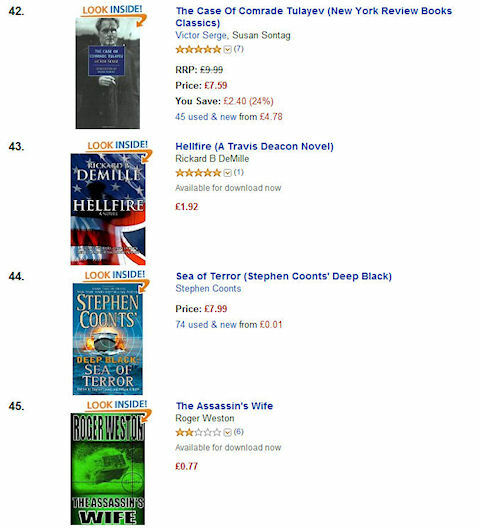 It also made it into the top fifty serial killer novels. 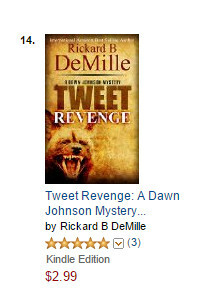 As I write this post, TWEET REVENGE is still on both Kindle Best Seller lists. I did several things for pre-release marketing. One I had never tried was to uploaded a review copy to NetGalley. It got dozens of downloads, but only one review so far. I understand that it may take weeks for the reviews to show up. Instead of explain NetGalley, and Patchwork Press who I used to get uploaded there, I will save that for a separate post. I will post information on several of the different steps in my publication process in case someone has questions. Also this weekend my first Novel, HELLFIRE, made it up to #2 on the Political Thriller Best Seller List on Kindle Australia! I don’t know all of the details about his passing. I do know that few men had the range to bring life to such diverse work as Mork and Mindy all the way to Dead Poet’s Society. The movie Good Morning Vietnam was a true classic, and a success only because of him. Goodbye. You will live forever. I want to try something new. 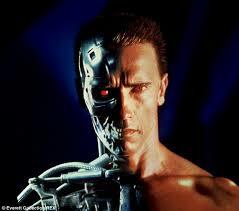 I’m going to name two characters from my next book, TWEET REVENGE, after two random people from the Cyber Universe. The only requirement is that they subscribe to my new newsletter. The newsletter’s first edition will be published in early August, and will be published approximately every other month after that. The first issue will feature – among other things – the names of the lucky winners. It will also announce the exact publication date of TWEET REVENGE. Subsequent editions will have writing tips and facts, and interesting cultural commentary. TWEET REVENGE, though, is the story of Dawn Johnson, a rookie FBI Agent who has a serious problem with her boss. She also has a major conflict with the head of the task force she’s assigned too, the redneck Sheriff Scates who doesn’t get along with anybody. Dawn must put aside her personal agenda, get along with people that have no desire to get along with her, and catch a serial killer who taunts authorities by broadcasting every step of his murders on social media. It’s a fun, exciting, action packed story that could have characters, one male and one female, named for you. Simply send an email with “I’m a character” as the subject to character@rbdemille.com. That’s it, you’ll be entered. Your name will live forever in print. Thanks, and don’t forget to check out my first novel HELLFIRE ( http://amzn.to/1r7HEJt ), which has been an Amazon Best Seller in the US, UK, Canada, Australia, Germany, France, India, Mexico, and . . . well, you get the picture. Why not be a character? Join! I’ve had a number of comments and reviews on my novel Hellfire which mentioned the female lead, Dee Jones. Dee is tough, smart, and capable I made her that way on purpose. I made her that way for a reason. Literature has a wide-range of strong female protagonists who take charge, stand up for what they believe, and achieve their end goal. The women in these books become role models for people, female and male, around the world and expand traditional patriarchal roles. In Pride & Prejudice, Lizzie Bennet is a strong, intelligent woman who goes after what she wants. Her goal is to marry for love and not money. She is a loveable character who even Jane Austen admired by calling her “delightful.” She is often embarrassed by the habits of her mother and sisters and inspires readers to be more like her. The story is about how Lizzie and the man she loves Darcy, end up overcoming adversity to experience love. Despite the challenges she faces she’s able to persevere through it all to get what she wants – love. In Harry Potter, Hermoine Granger is a role model to many readers due to her intelligence, willingness to help others and bravery. There is nothing that she wouldn’t do to help her friends. Her character is realistic, and represents what growing up is like. Readers growing up with the Harry Potter series were able to relate to her character in a meaningful way. She is very self-aware, always knowing what she’s fighting for and she doesn’t quit until she’s achieved her goal. She doesn’t compromise who she is to please someone else. In The Hunger Games, Katniss Everdeen is a strong female who must overcome countless challenges just to survive. While her sister was actually enlisted in the Hunger Games, she took her place instead to protect her. She knows how to use a bow and arrow, which she learned on her own. She may not be as book smart as the other female characters but she has street smarts that help her survive. She does whatever it takes to survive and reach her end goal – live. In my next novel Tweet Revenge, a serial killer called Justice uses social media to taunt authorities. The protagonist, Dawn Johnson, is an African American FBI Agent. She joined the Bureau because her father, who was also an FBI Agent, had disappeared and was presumed dead during an undercover assignment. Dawn is a strong, confident woman with a bit of an attitude. She must overcome obstacles of prejudice and distrust to find the serial killer. Who are your favorite strong female protagonists in novels? Over the last few weeks, HELLFIRE has been an Amazon Best Seller in the US, UK, Australia and Canada. It reached the top 10 on the list in Canada and Australia for Political Thrillers. Over the past several months HELLFIRE has been an English language Amazon Best Seller in the US, the United Kingdom, Australia, Canada, France, Germany, India, Spain, Mexico, Brasil, and Mars (just kidding, but Amazon’s probably working on it). Thanks to all of my readers. HELLFIRE is definitely worth a read. A Best Seller Weekend for HELLFIRE. The last few days have been pretty rewarding in terms of public response to my novel HELLFIRE. It’s still a best seller on Amazon Kindle for political genre, for over two months now. It also made the Best Seller lists in Amazon UK and Amazon Germany. Petraeus Resigns, But Benghazi Is The Reason! Washington can exhale now. The election is over, and while the truth is still their enemy, it’s less of a danger. I say this because several incidents have just come to light. This should not be a surprise. The polls have closed, so the curtain hiding the latest dirty secrets has begun to be drawn. We now know that Iran attacked one of our drones in international airspace before the election. We now know that HHS has planned an assault on the States over Obamacare. Now we discover the latest pre-election secret to be hidden until the post-election celebrations have ended. General David Petraeus, Director of the CIA, resigned. General Petraeus is, and has been, an effective and inspiring leader. He calmed the trouble seas in Iraq, turning the hurricane that threatened to sink our involvement there into a minor storm that merely washed our influence back into a sea of ineptitude. Petraeus is known as a man of integrity and honor. Petraeus is known to be on the schedule to testify about the Benghazi debacle before Congress. Petraeus resignation is allegedly the result of an extramarital affair. However, by resigning now he eliminates the risk of being forced to resign for much more damning reasons later. I do not believe that infidelity is the reason behind Petraeus’ decision to step down. Cheating on a spouse, in the nation’s capital, merely qualifies him for Congress. The fact that he didn’t fool around with an employee, or service member under his command, simply means he would run as a Republican. People who have dedicated their lives to serving their country DON’T often quit because of a single indiscretion. People who have dedicated their lives to serving their country DO quit to when faced with the unacceptable choice of having to lie before Congress, or telling a damning truth. I believe the General resigned in order to break his date with Congress. I’m not sure it was even his decision to resign. I suspect the White House asked for his resignation. I’m convinced that Petraeus would have testified truthfully to Congress. I believe the truth is something the current administration is deathly afraid of. Benghazi will certainly become a benchmark for incompetence. Hillary Clinton already announced her departure. Her State Department showed callous, if not criminal, incompetence in abandoning the Benghazi mission to terrorists. Now Petraeus, who certainly knows what really happened during that critical period, resigns as well. Oh, one more detail, his resignation is effective immediately. That means no testimony before Congress – no embarrassing details revealed. Benghazi is the reason Petraeus resigned; the affair is merely an acceptable excuse. The White House knew since the FBI had already investigated the affair for “security reasons.” This is the perfect moment to make him disappear, after the election but before he can tell the truth about Benghazi. I have scheduled a book tour through VBT Café, and I’m very excited. The scheduled stops look fantastic. The stops are all for the month of September, and with a total of nineteen locations in all. This is more than I’d anticipated, they did a great job. Please stop in any and all that you can. It will be fun.